Storms Blog: Revolution Makeup Review. 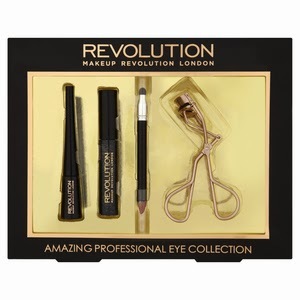 Today I brought the 'Revolution london makeup review' gift set, it included a Eyeliner, Glitter Eyeliner, Kohl Pencil and Professional Eyelash Curler. The eyeliner is a wand applictor and it is really pigmented, it looks great once you have applied it. Although personally I feel the wand is slightly large to get a perfect wing or defined line (this might just be my eyeliner technique though). This is the same with the glittery eyeliner, the pigmentation is great although the wand is to big. The Kohl pencil (double ended) has not got a great colour, it fades quickly. This is the only thing which I feel lets this set down, once again its only my opinion though. I would reccomend this set because it is great value, you get 4 items for the price you would pay for one 'up market' mascara, although you have to bare this in mind. Low prices normally means slightly less quality products.